Master in Modeling and Computational Science. Modeling in Mathematics and Optimization. 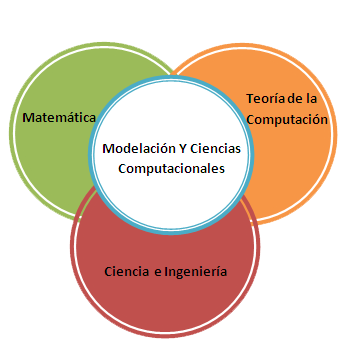 The master in Modeling and Computational Science is offered by the Department of Basic Sciences and its research group on Mathematical Modeling ERATHOSTENES. The master is an interdisciplinary proposal privileging the well substantiated knowledge of basic sciences and computational science, under the scientific modeling methodology. The aim of this program is to train masters with the ability of transforming their professional scientific task, either through deepening of the classic knowledge of the phenomenon that they approach daily, or by researching new explanatory models to generate new knowledge of their careers. Next diagram shows the main interaction among sciences that underpin the master's degree in Modeling and Computational Science. Modeling and Computational Science is larger than the intersection among the three component parts, but it is not entirely contained in their union. Computational Science provides and strengthens the bridges to science and engineering by connecting the components; in any case, it cannot be considered as a separate island. Computational Science uses computing by implementing of mathematical, statistical, and physical models in real situations that come out from the modern science, engineering, medicine, business, development of products, and almost any area that you can imagine. The models and computational simulations have become an essential part of the modern research. The simulation is a research complement, allowing computational experiments of phenomenon which are impossible to perform in the real world. The training plan is dynamized around a permanent consensus among basic sciences, the process of scientific modeling, and the effectively and efficiently computational intervention. Then, the master is founded in a theoretical, practical and/or simulated elaboration of the real world. The program pursues a graduate student who is prepared to be a scientific actor in the following fields: the job market, research career in the academy, or industry, or doctoral studies. Who hires a master in Modeling and Computational Science?